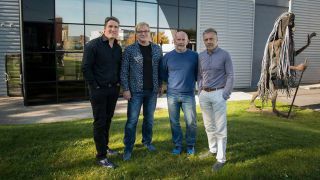 L-Acoustics’ holding company, L-Group, has acquired CAMCO, manufacturer of high-end amplified controllers, DSP, and audio network solutions for the professional audio industry. CAMCO has more than 25 years of experience developing amplified controller technology and holds several patents in the trade. Based in Wenden, Germany, CAMCO counts 50 employees and distributes its products in 60 countries around the globe, in addition to supplying components to the industry’s leading professional sound system manufacturers. CAMCO will maintain its full team and headquarters in Germany and continue to manufacture its signature i-series, Vortex, D-Power, and Q-Power amplified controllers while also developing OEM solutions for L-Acoustics and other manufacturers. CAMCO will keep its brand name and will become a sister company of L-Acoustics, woodworking manufacturer SIMEA, and L-ISA, creator of immersive sound art solutions. L-Group is an independent company owned and operated by the executive partners of the group and its subsidiaries.